News: Starbucks UK and Starbucks Ireland Launch Single-Origin Espresso (Featuring Guatemala Antigua). 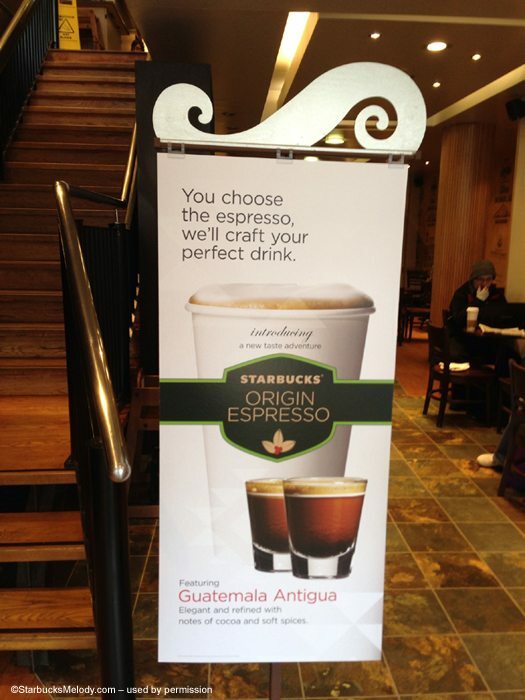 There is also an official Starbucks UK blog article on it here. The whole thing is just super cool to me. I have tried a couple of different Starbucks coffees as espresso shot, and the experience and variety is fun. A long time ago, when 15th Avenue Starbucks was an “experimental store” (it no longer is experimental), it offered Casi Cielo as espresso shots. That was fantastic. And as you may know, Casi Cielo comes from the Guatemala Antigua growing region. This is not the first time that Starbucks has experimented with different espresso options: Last year, the Brewery Blocks Starbucks in Portland, Oregon offered Guatemala Antigua as an espresso option. 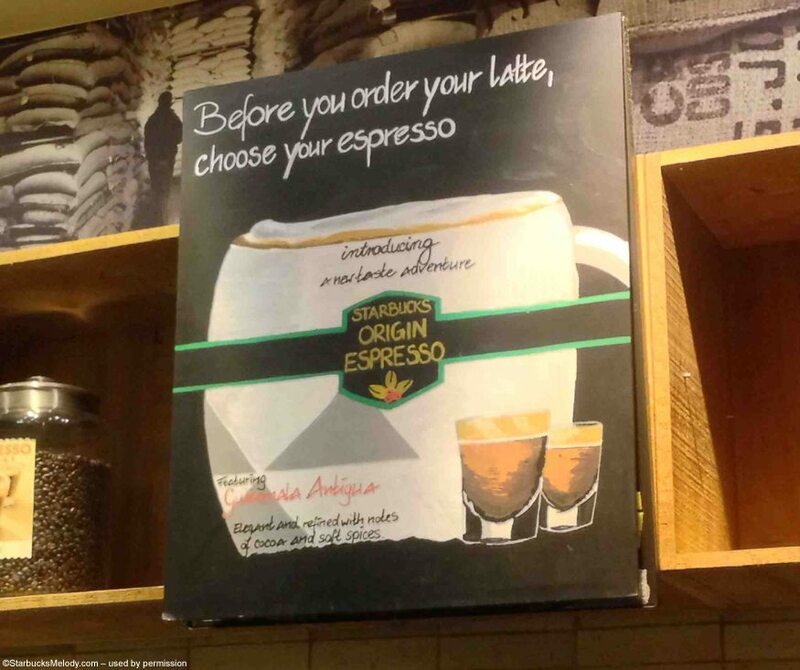 For about a year now, Starbucks France has offered a blonde roast as an espresso shot option. I definitely wonder if a single-origin espresso would work in the United States – that’s a lot of stores to supply with an origin espresso roast. 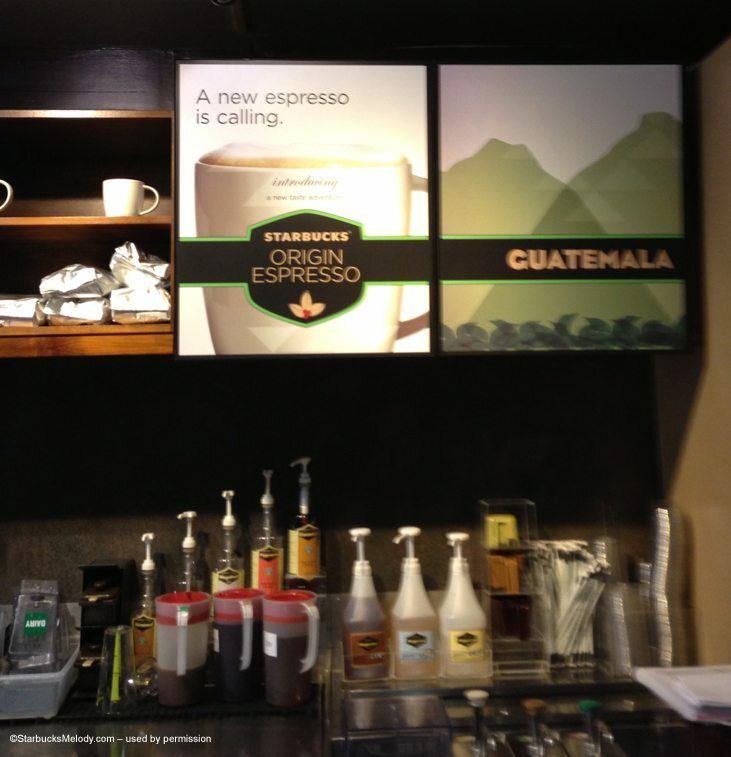 Maybe Starbucks could launch Guatemala Antigua espresso as an option for the Clover Reserve stores? What do you think? 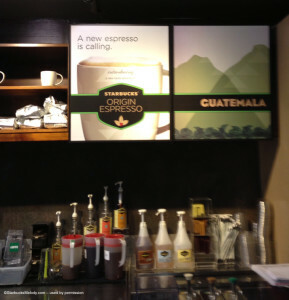 I would love to know if you’d order an espresso beverage made with a shot of Guatemala Antigua. Have you tried this? Newest Reserve Coffee: Starbucks Fair Trade Tanzania Southern Highlands. I’m really enjoying the Guatemala Antigua espresso. It’s nice to have the variety of choice, and its nice to have the UK stores trying something different. The free coffee promotion they were running as well to promote it was excellent. Gold card members were able to try it ahead of everyone else, I first tried it Thursday 28 March. One thing I would say is that I don’t think its worth 25p extra, though as I get it at no extra cost it is now my espresso of choice! I think this would be just wonderful…. to have espresso options? That would be heaven to me! Unfortunately, I don’t see this working (on a regular basis ) in the fast-paced USA. Would love to go to a Sbux in London. or, London even without Sbux…I love that city. it is possible, but in order for it to happen i had to come up with a business plan as to why, and show results. we started with christmas espresso and used those shots to drive at home coffee sales. tribute shots were really popular, but surprisingly enough, the veranda shots are my favorite!!!! It launched in Germany as well some weeks ago. I don’t like this new option so much. To me the Guatemala is simply too weak to make me awake. A regular Latte e.g. tastes just like milk. I do not get the flavor of the espresso in it. It’s better if you try it in a sirup based drink. Cocoa Cappuccino for example. But there were a few people in my store that appreciated this new option. These people did not really like the strong Starbucks coffee in general and they love the new option. Sebastian – Thanks for the info. 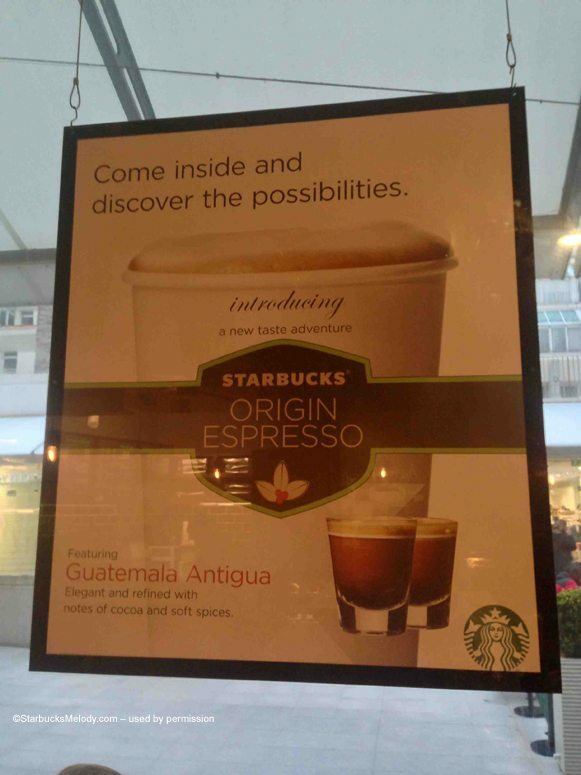 As soon as I can, I’ll update this post to show that it Starbucks Germany launched it too. I had kind of thought it might be the opposite – the lighter Starbucks coffee espresso would good as a solo shot, but doesn’t stand up to 10 flavor modifiers. One more reason this might not work in the US: A venti white mocha with 4 pumps raspberry would just mask the flavor of the single origin espresso. When I used to work at Starbucks, during downtimes we put different kinds of coffee beans in the espresso machine for ourselves to taste (usually our markouts as I didn’t really go through a pound a week by myself.) Some of them were amazing! My favorite was the Arabian Mocha Sanani. This was good with a mocha made from Chantico…LOL. I never got around to trying it with Guatemala Antigua…but the Casi Cielo makes divine espresso! The Brazil Ipanema Bourbon was great as espresso too as well. My favorite drink to make with that was soymilk + banana sauce (remember that?) + ice in a blender…with a couple of shots of that on top. Some others didn’t work out so well. I didn’t care for Kodomo Dragon or Sulawesi as espresso and Kenya…not so much. A couple of black apron reserves got the espresso treatment too…LOL! I worked at a rural location, so running out of coffee was a common thing for us. Using Christmas Espresso was my favorite! But we’d served down the “backup” list all the way to Caffe Verona: Espresso, Italian, French, and then Verona. That week was nuts. Mel, it on the U.S. POS as a test button. So it’s being used or planned on being used somewhere, sometime. Maybe your super sleuthing skills could search out the sirens secrets? doug.